My 2009 garlic is on the left, the purchased Amish garlic is on the right. Yep, on March 6th I planted two types of hardneck garlic: some of mine that I'd harvested last year, and some from our Amish neighbors that I bought at the only store in town, which is 10 miles away. Talk about your one stop shopping. It's an odd little place, usually filled with various odd characters hanging around (we're all a little odd in some way around here) where you can buy everything from bags of potato chips to bar and chain oil, fence posts to frankfurters, gas and gates to—some days—garlic. The only other business in town is the itty bitty post office, and it closes for lunch from twelve to one, which just happens to be the time I am almost always driving by. Thankfully I can call up to the store before I head out and ask the owner to go over and get our mail (which the postal service won't deliver to the farm) from the post office, so I can pick it up at my leisure from him, rather than racing out the door in the hopes of getting up there before noon. You also can't access your post office box unless the post office is actually open, but that's a whole other story, and I'm getting sidetracked. So a little brown paper bag of garlic appeared on a dusty shelf next to the candy bars one day in late February, and the garlic looked pretty good considering it had probably been harvested the summer before. Big fat cloves, no sprouts showing, a sign that said 75 cents a head or three for a dollar. "It's from the Amish," the store owner informed me as I started pulling out heads. I'm really beginning to love these people—and I still want to build myself have Joe build me one of those sweet little cold frames. I bought three dollars' worth. "You know you could plant this garlic," the store owner said as I paid for my garlic, two 50-pound sacks of alfalfa pellets for the sheep, a hundred pounds of oats, and a hundred pounds of dog food. "That's what I was thinking of doing with it." "But you know what you need to do?" After tasting the garlic, I bought several more heads the next week for planting. I figured I had nothing to lose, though I didn't have real high hopes. I've grown some really nice garlic in the past, but most of it was many years ago, and it went into the ground in fall. Lately, for various reasons, my harvests have been downright depressing—including the year I spent $77.00 on the stuff. I planted the bulbs about 2 inches deep with the pointy sides up in one of my 4'x8' raised beds, and then mulched the entire bed with a heavy layer of sheep manure bedding hay from the barn (you can see a photo of the half-mulched bed and read more about fertilizing with sheep manure here). 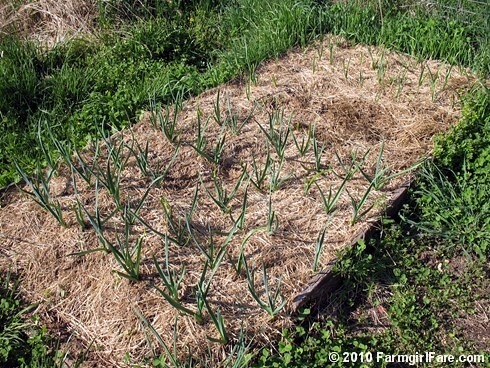 What's great is that the mulch gives your plants a small dose of organic fertilizer each time it rains or you water, until eventually all the manure works its way into the ground, and you're left with a hay barrier impervious to weeds, and then that eventually breaks down and helps amend the soil, too. I was suprised at how quickly the garlic sprouted and took off—I mean, look at all that growing it did in just 9 days in April—but it soon became obvious that my pathetic little bulbs were no match for the Amish supercloves. See the spindly little plants in the back section of the bed? That would be my garlic. My garlic eventually disappeared into the weeds, but the Amish garlic took off and put on flower stalks, called scapes, telling me that it was hardneck garlic rather than the softneck variety, which is what you find most often in supermarkets. (I also just read in the latest issue of Organic Gardening magazine that supermarket garlic is often imported from China and sprayed with toxic chemicals to keep it from sprouting.) These flower stalks need to be trimmed off so the plant will send all of its energy down into the bulb. Garlic scapes are edible, and over the past few years they've become quite the darling of the food world. You can do all sorts of things with them—stir fry them, toss them in salads, put them on pizza, even grill them—and while many people claim they have a fabulous mild garlic flavor, mine are always really strong, to the point where all I taste is burning hot, and I'm somebody who loves the taste of garlic. I tried making garlic scape pesto a couple of years ago (even took photos! ), and oh my gosh did it leave quite a taste in your mouth—for days. I need to do more scientific research, but I think that the flavor has to do with the type of garlic plants the scapes come from. Also, some of the garlic scape pesto recipes I came across literally called for like just two scapes in an enormous quantiry of olive oil and cheese. I should probably try cooking garlic scapes, and see if that mellows out that harshness. Another sort of byproduct of homegrown garlic is spring green garlic, which is simply a young garlic plant you eat most of, and it really is mild and tastes wonderful. 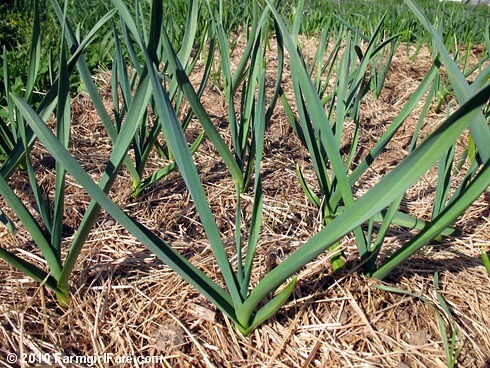 In fact, I usually try to double plant my garlic so that I can pull out every other plant to eat as green garlic in the spring. You can read more about my love affair with green garlic here. Anyway, I snipped off all the scapes (no idea what date) and fed them to the chickens, who mostly turned up their beaks at them. It is amazing what the chickens will eat, and they really help cut down the guilt factor when it comes to tossing stuff out, whether it's from the garden or the deep freeze. Pizza is one of their favorite foods. 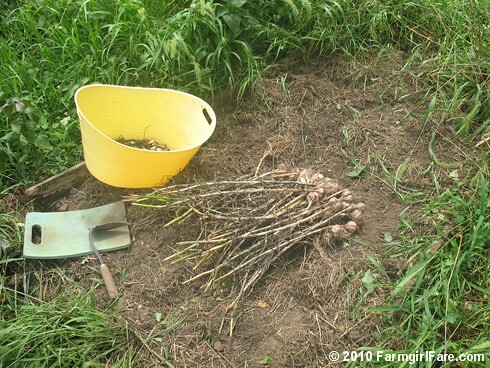 The best time to harvest garlic, as well as plant it, is not clear cut, and I actually have a separate post planned about planting and harvesting garlic that I hope to have up soon. Hint: there is no one answer to either question, and right now isn't the time to do either. I dug up a test head of my garlic the first of July, when about half of the leaves on the plant had turned yellow, and it looked like the bulbs weren't quite formed and could use a little more time in the ground. The tricky thing about growing garlic is that towards the end of its growing cycle, it shouldn't get wet, since this tends to rot the papery outer layer which helps it keep from rotting in storage. That's probably why garlic grows so well in northern California (where I grew up but never grew garlic), since it usually stops raining by April. Here in Missouri we have rain year round, though never on a certain schedule, which is probably one of the reasons my garlic suffers some years. Garlic heads left in the ground too long will also start to split apart, and this invites rot and insects into the exposed cloves. Unfortunately I ended up in the hospital right about when my garlic was ready to harvest, and then it rained a couple of times. When I finally got around to digging it up on July 27th—by which time the stalks had completely dried out—I was pleasantly surprised by what I found. A lot of the papery outer layer was gone from most of the heads, many of the cloves were separated, and there was some insect damage, but overall it wasn't too bad, and the cloves were bigger than any I'd harvested in years. I brought the loose cloves straight into the kitchen and laid the rest of the heads—with the stalks still attached—in a single layer on a big plastic shelf in the greenhouse, which I then blocked from most of the light with a piece of tin siding I found hanging around. You want the garlic to cure for two to three weeks in a dry, well ventilated place, out of the light. This was the best I could come up with. During previous years I've cured garlic and onions (though onions need to cure in the sun at first) on an old screen door laid horizontally and resting at the edges on boxes of canning jars up in the second story scary part of The Shack (lots of good ventilation that way), but these days it's just too scary up there. I'm definitely going to hold back some of my harvest for (hopefully!) fall planting. But the rest will be put to good—and tasty—use. Need some fresh garlic inspiration? Below are some of my favorite ways to use it. Did you grow garlic this year? How did it go? 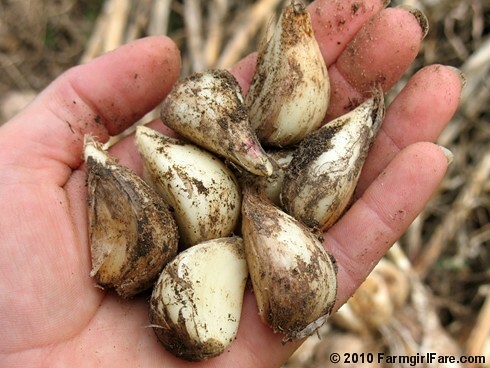 Any garlic growing tips, tricks, stories, or other interesting tidbits you'd like to share? Anybody ever plant theirs even later than I did? What happened? If you've written about your garlic growing adventures on your own blog, you're welcome to include a link to the post(s) in your comment. What I like to make with fresh garlic? All kinds of things! © FarmgirlFare.com, the garlic breath foodie farm blog where try as I might, I am obviously incapable of writing a short garden blog post—and isn't it wild how different the colors are in the sunny garlic bed photos vs. the cloudy one? What symmetry! 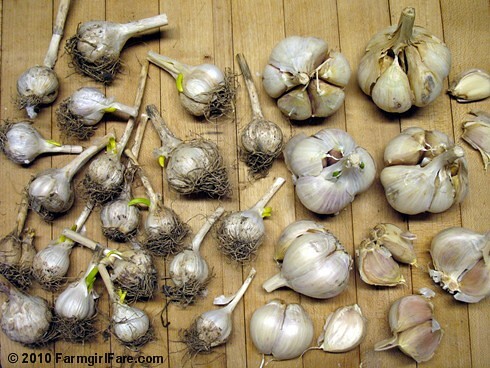 I live in Melbourne and I'm about to publish a post on planting garlic (www.turnipsandtoile.blogspot.com) - we're upside down in seasons to each other. 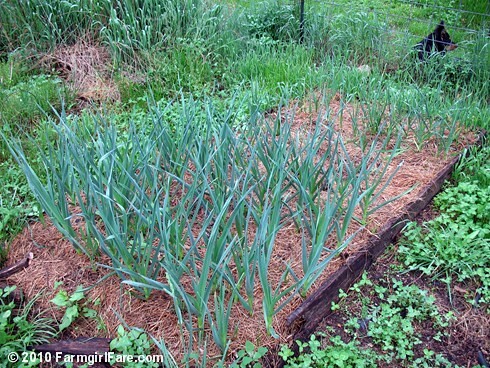 We have a mediteranean climate in Melbourne and garlic can be planted year round. Yours looks beautiful! I plant mine around the edges of a raised bed and harvest when the stalks have mostly died back. Imported garlic, mostly from China, is sprayed with Methyl Bromide - a mutagenic and possible carcinogen. I eat my own, buy Australian or do without! 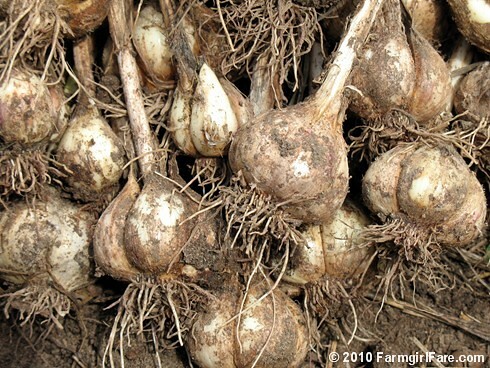 I love to grow garlic, too, but I have a pink rot problem that lives in the soil, so I have to dig it up early because the rot thing happens just at the end of the growing time. They are smaller, of course, but still yummy, and at least I get a crop. Before I knew to dig early I would lose over half my crop. I dry them on screens supported by 5 gallon buckets in the back of my greenhouse----the part with no windows. (My GH is an A-frame with acrylic panels on the south only.) I dry my onions that way too. Perfect place. Dry,Airy,Warm,No direct sun. This years garlic is all cleaned up and tucked in a basket in the basement. I grow only Ore. Blue now. It's seems just right for our tastes. Rather mild and it keeps until the next years crop is ready. I miss scapes though. Ore. Blue doesn't have them. Oh my gosh. That's good...you really planted in March!?!. I grew garlic for the first time this year...but planted in October. lol. A lot of my Garlic actually looks similar to yours but I've had mine harvested since late June. I don't know whether it is psychological, but I think it tastes better than storebought. Can't decide now whether to eat it all and buy more seed cloves or same some and replant. I will definitely plant garlic again this year - at least double what I did last year! I didn't plant mine late... I got my German hard necks into the ground in October. they were blooming by mid June (which I have heard is rather early of Chicago area, but that's global warming for you). I harvested the weekend after the 4th... and so far everything I have harvested has been awesome. I let it cure in my garage, and then a week and a half ago I cut them and put them in a onion bag in the basement. Hopefully, it is a cool enough dark enough and dry enough place! The day I harvested I ordered some different varieties from seed savers, so I will grow 3 different ones this fall. I can't wait!!! Really interesting, thank you for sharing! I am going to try my hand at garlic for the first time this fall. It's me again, and I must add this. You can pickle garlic if you think it it's going to grow. You take a very clean jar and fill it with pealed cloves, then pour vinegar over to cover and refrigerate. Use it up that way in any dish you choose. Really not too much different than fresh and better than store bought and/or wasting it. i love the scapes, and the blooms even. Awesome sauteed. 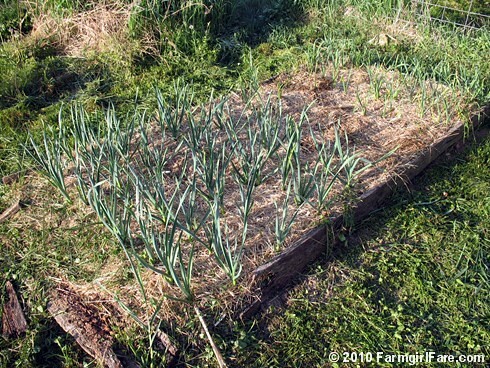 I plant my garlic around September/October and harvest early June. Garlic does not like spring in Texas - as spring does not exist in texas! I got the garlic harvested about a month ago, and have since totally forgotten about it. So it's still sitting out in the shed drying. I really need to cut the heads off and put them in a mesh bag in the pantry. As for scapes . . . when they're harvested also seem to affect the strength of the taste quite a bit. I was late doing it last year, and they were pretty woody and VERY strong. I pureed them and used just a bit to make a white bean dip that I bring to potlucks a lot. This year I did cut the scapes off a lot earlier--maybe a little too early, in fact--and they were YUM stir fried. They reminded me of those green beans with lots of garlic that are always at Chinese buffets. So, yes, cooking them does tame them some. I finally planted garlic this year. Over the winter and harvested it sometime around March. Except I'm a moron and didn't do much research about *how* to plant such a thing and instead of separated the cloves, I just planted whole heads of garlic and then HOLY it got enormo and when I pulled it (after eating it as green garlic for weeks - which I love) the heads had sprouted alien offshoots and seemed angry. In a way that only oversized garlic forced to share space with too much other garlic can look "angry". Regardless, the garlic is very tasty and has just finished curing in the garage. Because 3 weeks isn't enough for me - I need 3 months of curing time to accommodate my Lazy. Well I grew garlic over last winter and spring... I couldn't kill the stuff despite record low temps and having to transplant it mid-season. One interesting thing was that on several of them I ended up with one large onion-shaped clove per plant--not multiple cloves as usual. These super cloves were really potent and were great for garlic bread, but I am still confused as to why they never split! We LOVE garlic in my house. We use so much of it in everyday cooking that I planted extra last november. It still doesn't seem like enough! This past year we were using garden picked garlic up until around April I think. I had no idea about store bought garlic from China and the chemicals they treat it with *shivers*. I wonder if thats a standard way of treating commercially grown garlic or if only China does it. Very interesting!